This song from Darling " un Vizhigalil" was sung by Harini. 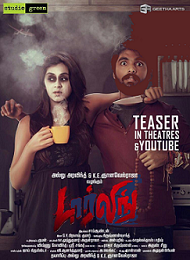 G V prakash debuts in this movie as Hero. This is said to be a comedy thriller and it is the remake of the Telugu movie Darling which release in 2010. This movie is produced by Allu Aravindh. He is also a Telugu director and he did a Tamil movie before two and half decades. It is distributed by Dream factory. Sam Anton is the director of Darling 2014. Pencil was supposed to release first but now it has overtaken pencil.